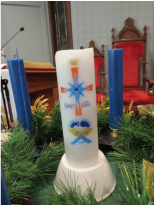 Advent Readings-- The advent candles are lit each Sunday during Advent. Individuals or families do the lighting and readings. Christmas Baskets---Each Christmas season we provide baskets for families in our county. We collect white gifts (paper products, personal hygiene products and non-perishable food) for the baskets. (paper products, canned goods, non-perishable items) to put in the Christmas Baskets. The United Methodist Men assemble the baskets and deliver them. Christmas Angel Tree---The angel tree gives us an opportunity to buy gifts for our Christmas baskets. Names are selected from the tree and Christmas gifts are purchased for him/her.